Winter is the perfect time to wrap up warm and head outdoors for a night time adventure and see the night sky in all its glory. Look up to the sky and see amazing constellations of stars, planets and galaxies – and if you’re lucky enough – the Northern Lights or a shooting star. 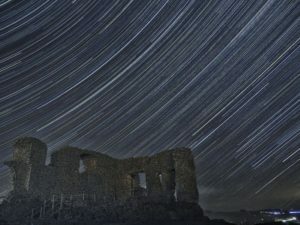 Kendal Casltle was featured as one of the best Lake District locations to star gaze by GoLakes, and we can see why. Kendal Castle overlooks the market town of Kendal and boasts a great spot for star gazing. From within the ruins of this Tudor home, which dates back to around 1200 and sits on top of a traditional mote-style hill, this easy to reach location offers the chance for enthusiasts to get closer to the stars and see an array of constellations, star clusters and galaxies in the night sky with the added bonus of being surrounded by a little bit of history. See the moon and its spectacular craters and dark seas of ancient, frozen lava; the infamous rings of Saturn or the beautiful Milky way, all from the comfort of Kendal! If your keen to learn about the cosmos rather than gaze in wonder, Kendal’s very own Astronomical Society, The Eddington Astronomical Society (named in honour of Sir Arthur Stanley Eddington, the famous astrophysicist who was born in Kendal) might be able to help. The society meets at Kendal Museum at 7pm on the first Monday of each month (except Bank Holidays). Meetings bring together astronomers and others who are interested in science and the cosmos, and provides a forum for astronomy discussions.